You probably hear a lot about resistance bands especially if you are a gym-enthusiast. A lot of people are now using them in fitness gyms and most probably, fitness classes make use of them. You might have also thought about the upsides of using these resistance bands and what good can they do to improve your fitness. What are the real benefits of resistance bands? Everyone can take benefit of adding the resistance bands to their training programs – whether you are a beginner or a well-conditioned athlete. Contradictory to the usual notion of some, resistance bands can add variety and challenge to any workout schemes plus they come in a convenient package where you don’t have to spend a fortune. Anyone can easily carry them around. It offers convenience so you can carry it wherever you go. Helps increase your coordination. Tension is always present during exercise; hence you have to calm your body down. Resistance bands help with your coordination and balance while allowing you to involve more muscles during the workout.Adds variety to your training. Let’s take an example the weight lifting. Weights oftentimes offer limited exercises that you can do with it. On the other hand, with resistance bands, you can modify your position in different ways. This can alter how your body will work during the entire exercise.They are appropriate for all fitness levels. Resistance bands have different uses and depending on its usage, they can be suitable for beginners to advanced fitness fans. They can be used for basic moves or adding more challenge to the usual moves.Resistance bands are convenient to use. You can easily pack these bands in your case while traveling and still can exercise even when you are not at home.They won’t cost you a fortune. Resistance bands are definitely inexpensive. Some band costs range from $6 to $20, depending on the store and the brand. This allows you to choose from several options if you are budget-conscious. 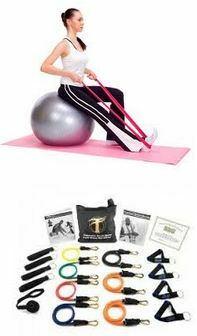 You will find out that there are various kinds of resistance bands available in the market and you can easily find them in almost all establishments including discount shops. Surely they are present in physical stores but if you are hunting for more to choose from and at the same time ensuring the quality, you may want to find them online. Most resistance bands vary in color, depending on their tension level. It is ideal to own at least three bands (e.g., light, medium and heavy) so you can work your muscle groups in different levels. There are resistance bands offering exchangeable handles. This means that you can take them off and make use of them with your other bands. Try to buy comfortable bands to make sure that you don’t have any difficulties when using them. For instance, you may want to go for the ones that are padded. Resistance bands have different types – there are double bands, figure 8’s and circular bands. If you are a beginner, you may stick with the basic tube with handles. When you are getting used to how it works, you may want to own the other types to add a little bit of challenge. If you have finally bought your set of resistance bands then you may start trying different resistance bands exercises. There are numbers of exercises associated with these bands. Some are chest press, squats, seated row and bicep curls. For you to consistently see the difference that your training program makes, it is recommended to add a little variety on your workout program. This would mean mixing your resistance bands exercises with barbells, machine exercises and dumbbells. Doing the same exercises will develop tolerance on your body overtime. You should add a little challenge for you to see the gains. There are endless possibilities for fitness with resistance bands. They allow you to achieve an optimized range of motion and challenge your body to move freely. It also allows you to make resistance while adjusting your movements. Combining few exercises with resistance bands will help you achieve greater wellness out of your fitness program. Adding resistance bands to your training will add more variety on your approach to staying fit while achieving convenience that meets affordability.